Today I have the distinct pleasure of interviewing one Shakespeare “The Equine,” a poet out standing in his field and, reportedly, a legend in his own mind. The Daily Haymaker: Good day, Mr. Shakespeare. Poet: Hay! And please, call me Mr. Bear. The Daily Haymaker: Right then, Mr. Bear. Lovely of you to join us from Poet’s Paddock today. How are things in pastures green? Poet: Well, Mr. Haymaker, we’re pretty laid back out there these days. The cruel winter is behind us, but we’re still waiting for the grass to be greener on our side of the fence. Everything is very late. The Daily Haymaker: Are you the only poet in your paddock? Poet: Yes, yes I am. The Daily Haymaker: Well, thank you …. Now if you could explain to our readers just when you came upon your poetic prowess. Poet: Well, it all started with the Scribe, of course. Poet: Yes. As you might imagine, having hooves puts me at quite a disadvantage when it comes to recording my musings. Poet: So, naturally when I was looking for a sucker, I mean horse mom to call my own I scanned the radar for someone who could write reasonably intelligibly. The Daily Haymaker: And you believe you found him? Her? Poet: Her, actually. Yes, I did, though I let said Scribe and horse mom believe that she found me. It’s easier that way. The Daily Haymaker: Of course. So, how long did it take for you to plant the idea in your horse mom’s head that you had creative notions you wanted to get off your mind? Poet: Not long, actually. She’s a sensitive soul and I could tell she was looking for an outlet. You know these artistic types, and if they’ve been in any kind of creative drought well, as you might imagine, they’re an easy target. The Daily Haymaker: So, how does the creative process work for both of you? Poet: Actually, Mr. Haymaker, I stand out in my field and eat, and she shows up at the barn one day and tells me we’ve written a poem. The Daily Haymaker: Really, it’s that simple? The Daily Haymaker: How many poems have you written together? Any chance of a recitation? A couple of lines, perhaps? While others’ eyes their own beauty proclaim. It matters most to she who calls me Bear. The Daily Haymaker: Yes, a sonnet ~ like your namesake William Shakespeare? The Daily Haymaker: William Shakespeare? The Elizabethan poet? You must have heard of him. Poet: Neigh. The only other Shakespeare of which I am aware is my father, Shakespeare in Love. Poet: Yes. And, just as a side, his father was Sherlock Holmes. The Daily Haymaker: Indeed! An illustrious background to be sure. Where were you born? Poet: Well, Germany. I’m Hanoverian. 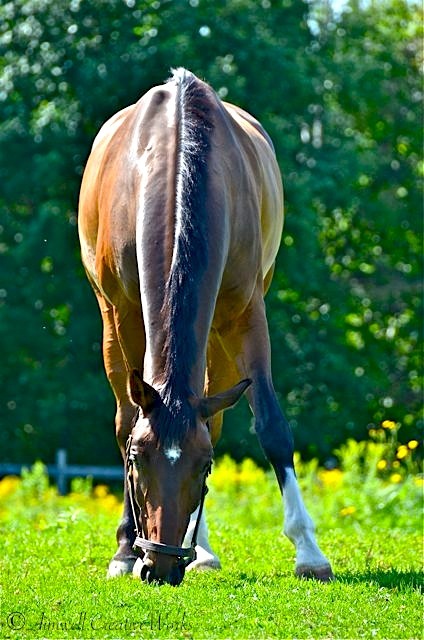 Some call me the Happy Hanoverian because I’m so, well, happy. Still, I don’t suffer fools. The Daily Haymaker: And your relationship with your father? The Daily Haymaker: Of course, I can tell as you yourself are quite debonair. Poet: Well, thank you, thank you very much. My mother, as I recall, was quite beautiful also. I have her even temperament. The Daily Haymaker: And what do you do for exercise ~ you know, to keep the creative juices flowing? Poet: Well, I’m trained in classical dressage, actually. One of my present challenges is to get back into shape since the Scribe has been unwell and I’ve had to back off my training. Things are picking up again, however, and this pleases me. The Daily Haymaker: Any chance you’ll show? Poet: I can’t answer that. It’s up to the Scribe. I’d be happy to but then, she must be comfortable. The Daily Haymaker: That’s awfully generous of you. The Daily Haymaker: And now, Mr. Shakespeare, I mean Mr. Bear, where might one read your poetic renderings? Actually first of all, please explain your nickname. Poet: Actually, it’s not a nickname, it’s a barn name. It’s something the horse moms do to make life easier for themselves. Some equines, like myself, have rather sophisticated names noted in the breed registry which are quite cumbersome to use on a daily basis. Creating a barn name makes sense. In fact, I don’t mind the name Bear. I’m told it was given to me because I’m like a big, cuddly teddy bear, whatever that is. I try to maintain my dignity by not thinking about it too much. Still, I get the sense it suits me. The Daily Haymaker: Now, where can one find your poetry? Poet: I have my own website, Poet’s Paddock. It’s currently being redesigned, but I believe it’s still up for grazing. The Daily Haymaker: Marvellous! Well, thank you so much for stopping by The Daily Haymaker today. It’s been a pleasure to speak with you. Poet: Pleasure’s all mine. Say, do you have some spare hay for a starving artist? 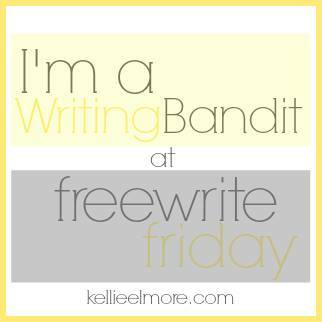 My response to Free Write Friday with Kellie Elmore. Select something nonhuman and write about it as though it were human. It is up to you whether or not you reveal what it is, but I have found it a lot of fun to leave it a mystery and allow others to guess at what you were writing about. Dorothy this was fantastic and a very fun read! I loved the idea of an interview with Bear and the reference to his scribe! I also loved the lines, ” You know these artistic types, …, as you might imagine, they’re an easy target.” Wow, can that be true! Great job! Good luck with the riding this summer! I just spent the last 4 days at my daughter’s first all Arabian horse show.